What a nice standard. The 46.3% fit perfectly. The focus has been moved a bit far in the direction of the sherry barrel, but he is good to face. Sherry-stressed heavy and intense nose with overripe grapes, raisins, dates, prunes. Chopped hazelnuts and almonds. Orange jam. Canned peaches. Some cinnamon and marjoram. A hint of sea air. Dry and on the tongue sherrybetonter entrance. Instant dry oak with raisins and dried apricots. Slightly salty and a hint of smoke. Mild herbs and spices. Hazelnuts, almonds, honey, caramel sweets. Marzipanbrot. Rapid astringent. Medium long and extremely dry. Still the dried fruits from the nose and tongue. Oak and a hint of smoke. My first impression is dominated by pleasant sherry influences and fresh (salty sea air) as well as floral notes. The alcohol (46.3%) is very well integrated and not noticeable. Sweet honey, nice caramel flavors, oranges, cherries, marzipan, lightly roasted malt, nuts, chocolate, spicy oak and a very soft hint of smoke are slowly rising from my glass. The scent is very full-bodied and strong. The beautiful complexity always surprises me again for a "only" 12 years old standard whisky. Strong start with a pleasantly oily texture. A slight tingling puts on the tongue tip (pepper / ginger). Sweet honey and caramel notes are immediately present and form the basis of taste. Toasted malt, walnuts, cocoa / chocolate, spices, ripe apples, oranges and dark sherry fruits (plums & cherries) mingle with the sweet foundation. The spicy oak notes intensify slightly in comparison to the nose and round off the aromatic variety with a maritime touch. Deeply hidden in the background, I register again a soft smoky note. The malt is wonderfully soft, varied and balanced. But beware: dangerously tasty! Medium to long, spicy-sweet and warm. 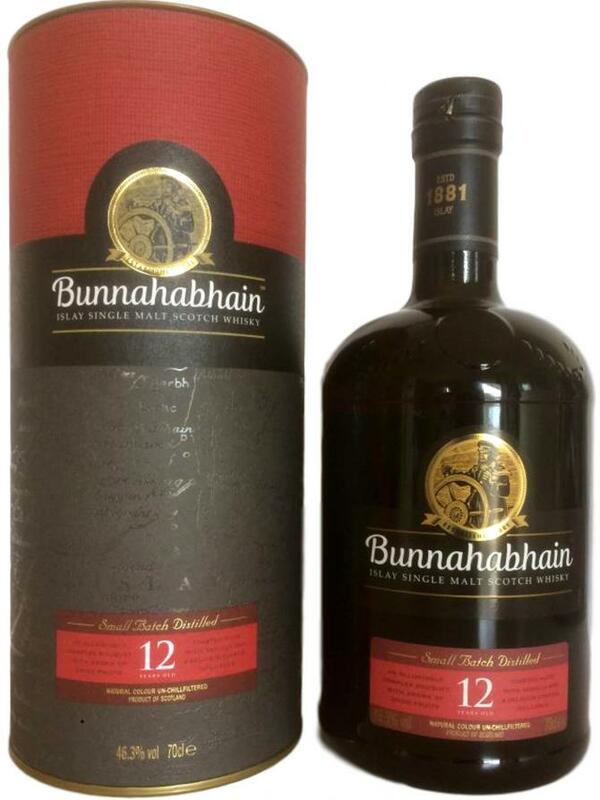 Mild sherry notes, caramel, malt and nutty chocolate gently end the Bunnahabhain. The spicy oak notes are palpable, but never too intrusive or dominant. I perceive neither bitterness nor dryness on the palate. 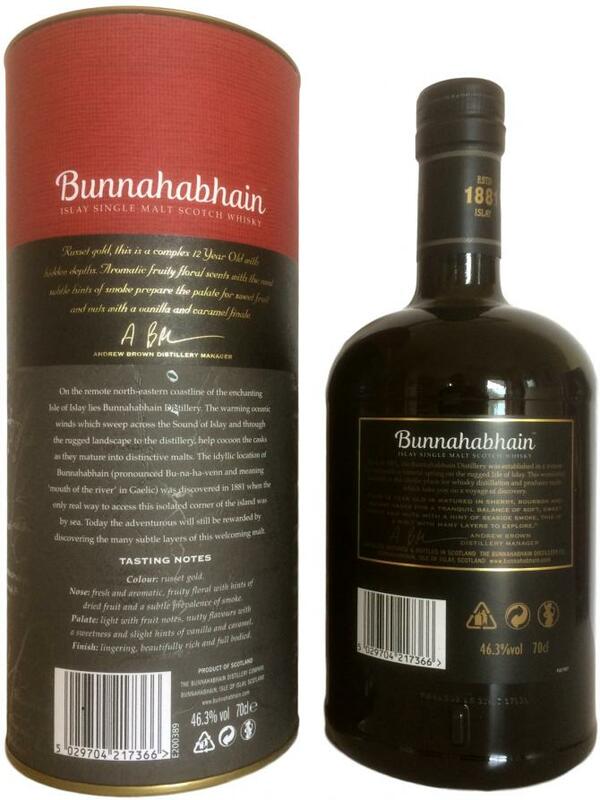 Bunnahabhain state ‘Small Batch Distilled’ on the label !! C: Very much a savoury, almost sour affair compared to the previous two Deanston. Tastes contemporary with an illusion of youth & age as if there’s 8 and 16yo juice inside. The mouthfeel is where it’s at. Otherwise, there’s something rather innocuous about this current 12yo batch. Aroma: caramel, candy, dark chocolate with raisins, blackcurrant jam, dried fruits (apples, pears), honey, flowers, lime, spicy pickle cucumber, menthol freshness. Very pleasant aroma, sweet and fruity, dominated by sherry. Taste: dried apples, pears, prunes, spices for mulled wine, a little pepper, bitter roasted walnuts, peanut butter, salted caramel. Finish: medium length, dried apples and pears, not sweet uzvar, a little salinity on the tongue. Nose a little neutral, needs aeration. Traces of dry sherry, dried fruits (hazel nut), some plums, mocha and cocoa. No trace of peat. Mouth well marked sherry, a lot of green hazelnut, mocha, made dry but pleasant. A little charcoal, mineral. End of mouth more on the plum. Very convincing for the price. Long finish, always on the nutty, some vegetable tips, mocha, very dry sherry. A very good value for money. I recommend.